Baby artichokes have no developed fuzz or fibrous leaves in the center. So, with careful trimming, the artichoke is completely edible. Prepare artichokes: bend back outer petals until they snap off easily near base; continue to snap off petals until leaves are half green at top and half yellow. Slice off green portion of leaves. Cut the stem level with the base and trim any remaining dark green from the base then cut artichokes in half. Cut out any purple or pink inner leaves. 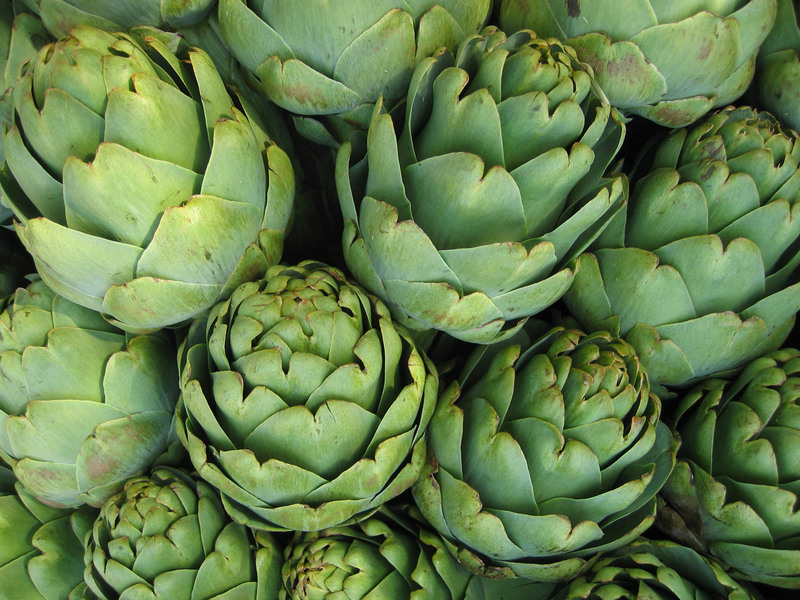 If the interior is white, the entire artichoke is edible. In a large pan bring water, lemon juice, carrot, celery and peppercorns to a boil. Add artichokes and cook until tender, about 7 to 10 minutes, remove artichokes from liquid and cool. Cook pasta in boiling water until al dente; rinse in cold water and drain. Toss with 1 tablespoon of olive oil; set aside. Beat eggs with heavy cream, Parmesan cheese, basil, garlic, salt and pepper. 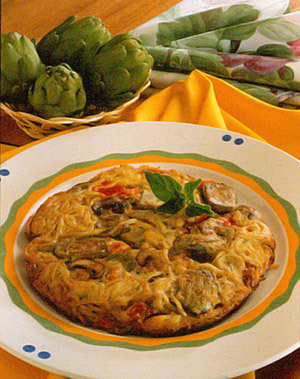 Stir in cooked artichokes, pasta, tomato and sautéed mushrooms. Heat remaining 2 tablespoons olive oil in large skillet. Pour in egg mixture. Cook on one side until golden brown and turn to brown second side. Cut into 4 wedges. Garnish with fresh herbs, as desired.